A pasta night, a little home cooking for me and the hubby. 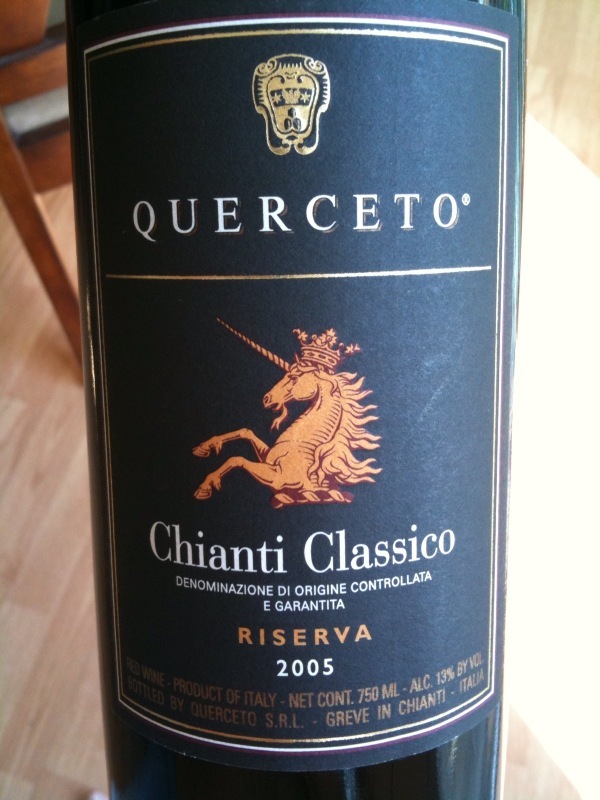 Wanting to go the traditional route with the pairing I pulled a bottle of Querceto Chianti Classico. Let's take a minute to do a quick review of Italian wines using this lovely wine as an example. First off, Chianti is a wine region in Tuscany and not the name of a grape. In fact for both Chianti and Chianti Classico the main grape is Sangiovese. 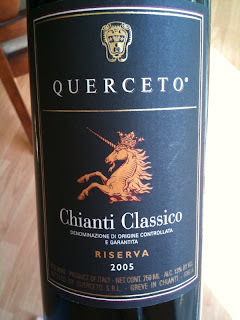 What makes Chianti Classico a "classico" is where in the region it is produced. Chianti Classico comes from the original core region of the Chianti region situated between the cities of Florence and Siena ("Classico" is used to indicate a "classical" or "traditional" region). There are different laws regarding the production of Chianti Classico including region, amount of Sangiovese required (80% for the Classico designation vs. 75% for "regular" Chianti), minimum alcohol levels, harvest yields, etc. Like other Chianti Classico wines this one is designated Denominazione di Origine Controllata e Garantita, DOCG for short. DOCG labelled wines are analyzed and tasted by government licensed personnel before being bottled (hence the G - "guaranteed"). To prevent later manipulation, DOCG wine bottles then are sealed with a numbered governmental seal across the cap or cork. This wine is also a "riserva", telling us that this wine was aged at least two years longer than normal, usually resulting in more depth and layering of experience for the taster. OK, now that we're up to speed on some of the rules about Italian wines we get to this particular one. It is, in a word, lovely. In the glass the wine showed a deep ruby red with fine legs on the glass. The bouquet was big and full, loaded with black cherries, blackberry, hints of violet and currants with just a hint of oak. This wine is medium-to-full bodied loaded with fruit, good acid and excellent tannins and a touch of minerality creating a long, lovely finish that went wonderfully with the pasta. I can see it going well with grilled meats as well, making it a fantastic wine to have at the BBQ grill. You should be able to find this for around $20 and it's and experience far above the price.